Ranking the Planet of the Apes Films, from worst to best – AiPT! We rank the films in the Planet of the Apes series from worst to best. My love and affection for the world from the Planet of the Apes franchise dates back to childhood. I discovered the saga via a twice-daily show on my local CBS affiliate called Dialing For Dollars. Host George Allen gave cash prizes and was unknowingly the first person to introduce me to the cinema classics of yesteryear. The show’s “Ape Week” compiled episodes from the Planet of the Apes TV-series (1974) as two-hour telefilms and had me hooked from minute one. After devouring these five telefilms (every time they replayed them), I later discovered the film series. One of the local UHF stations played a marathon of the first three theatrical features. So one Saturday afternoon, I planted myself in front of my grandmother’s black-and-white TV set and watched back-to-back-to-back Planet of the Apes, Beneath the Planet of the Apes and Escape From the Planet of the Apes. Soon after, I saw Conquest of the Planet of the Apes and Battle for the Planet of the Apes. With each sequel, the budgets were cut and productions more scaled down. But the scripts remained compelling and managed to move the story forward. Even as a kid, I never felt like I was seeing the same film. The 2010’s have been a gift for this Apes fan. Here’s my ranking of the series as a whole, from worst to best. Considered a remake of the original film, Tim Burton’s take has astronaut Leo Davidson (Mark Wahlberg) as he crash lands on a planet ruled by advanced simians. I’ve been enamored with the current reboots, but still appreciate elements of Burton’s effort. Danny Elfman’s score is solid and the ape makeup is beautifully detailed, but the overall settings seem claustrophobic and manufactured compared to the vast expanses of on-location fields and woods from the original films. At the time, I was elated to see the Apes franchise come back to life, but the overall story fell flat for me. Ironically, the most exciting scene was the climax when Davidson makes it back to Earth to find a statue of an ape has replaced President Abraham Lincoln at the Lincoln Memorial in Washington, D.C. This fifth and final installment of the original Apes film series shows signs of wear but still manages to be very entertaining and satisfying for enthusiasts. Ape leader Caesar (Roddy McDowall) tries to keep the peace between humans and apes as a group of mutant humans threatens both factions. Due to a much lower budget, the production is scaled down, but director J. Lee Thompson weaves the budget limitations into the story. The payoff is a beautiful final shot of the statue of Caesar crying, which asks: has the story come full circle? Will history repeat itself or make a turn for the better? Overall, the series goes dark with director J. Lee Thompson’s fourth installment, which makes for an interesting contrast to its more lighthearted predecessor, Escape From the Planet of the Apes. In the near future of “North America-1991,” humans and their enslaved apes are closely monitored in an apparent police state. We follow McDowall’s Caesar as his adoptive father Armando (Ricardo Montalban) tries to keep him hidden from harm. The pair offers the film’s more heartfelt scenes. When Armando dies, Caesar trains the enslaved apes and a violent revolt ensues against their human masters. Conquest was filmed in the newly designed (at the time) ultramodern complex in Century City, California, giving it a cold, futuristic setting. The film doesn’t compare with its predecessors or later 2010’s reboots, but still stands on its own as a worthy action flick with a message. Written by Paul Dehn and directed by Ted Post, Beneath picks up exactly where the original left off. Astronaut Brent (James Franciscus) crashes on Earth and joins Nova (Linda Harrison) in the search for Taylor (Charlton Heston), which culminates in an underground confrontation with a race of mutants who worship a nuclear bomb. While not one of the better sequels, Beneath does follow the same themes and pacing of its predecessor. The introduction of the mutants and appearance by Heston as Taylor set it apart from the original. I tend to pair Beneath with the original for home viewings as they are directly connected. James Franco plays scientist Will Rodman, whose testing an Alzheimer’s cure results in a gas that elevates the intelligence in an army of caged apes. Director Rupert Wyatt utilizes revolutionary CGI ape makeup to much success in this story that may or may not tie into the original series. Rise successfully navigates between epic action sequences such as the Golden Gate Bridge battle finale with more intimate and dramatic scenes. The film takes its time to develop human relationships, especially between Rodman and his father Charles (John Lithgow) who suffers from Alzheimer’s. At the core, is the relationship between Rodman and Caesar (Andy Serkis), the evolved chimpanzee from his lab who he adopts and eventually leads the ape uprising. 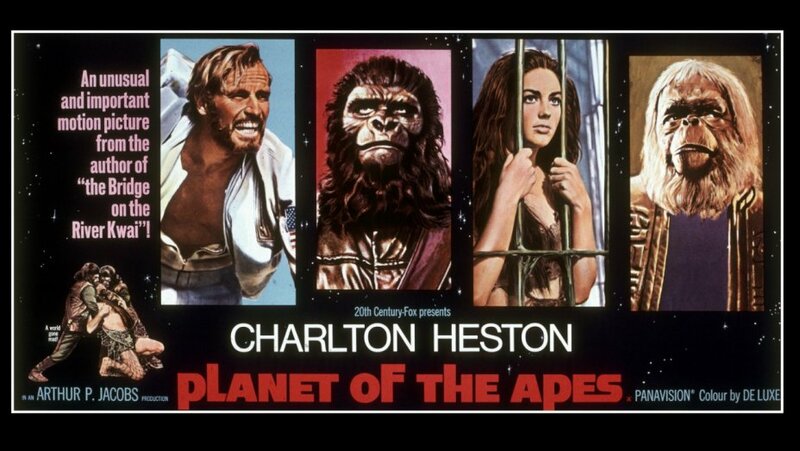 This second film in the current Apes series, directed by Matt Reeves, follows Caesar as he tries to keep unity amongst his band of apes as a faction of humans fleeing a deadly virus (introduced in Rise) discover his whereabouts. Jason Clarke and Gary Oldman are the standout non-ape performances, but Serkis proves himself the dramatic core of this series as Caesar. The CGI ape makeup has also much improved over the already refined appearance in Rise. This third film in the original franchise is directed by Don Taylor and written by Paul Dehn. It involves three chimpanzees that survive the ape planet’s destruction at the end of Beneath. Cornelius and Zika (McDowall and Kim Hunter) and their companion Dr. Milo (Sal Mineo) arrive in modern day America of 1973. The public finds them fascinating as we enjoy a well-humored, fish-out-of-water story which serves as a direct contrast to Taylor’s situation from original film. The President’s Science Advisor Dr. Otto Hasslein (Eric Braeden) discovers Zira is pregnant and imprisons the apes for questioning. Escape features a charm and comedy unseen in the previous two films that quickly turns dark. I never thought any Apes film could measure up to the visionary epic of the original Planet of the Apes. Then I saw War for the Planet of the Apes. The two films together serve as perfect bookends to the series. While the original gradually brings us into the world of the apes through the eyes of astronaut George Taylor (Charlton Heston), War serves as a climactic battle epic that brings us out of the world in a most bittersweet but satisfying action-filled manner. The special effects of 1968 fit the era and I’m sure were as eye-opening at the time as War’s effects are today. Andy Serkis’s motion capture performance as Caesar in War is Oscar-worthy as a leader on a personal mission of vengeance targeting the Colonel (Woody Harrelson) who murdered his wife and son. I felt that lump in my gut throughout most of the film’s fast 140-minute running time. War’s bittersweet conclusion could easily serve as “an” end to the near 50-year Apes saga and could even better serve as “the” end.